If you had a serious, life-threatening health problem, what would you hope for? Defining Hope is a film that provides answers to that question, from people living this experience, and the nurses caring for them. This film explores what is most important in life, through eyes of hospice nurses, and their patients and family members. · Spending time with family. · Making each day count. We see nurses doing what nurses do in caring for their patients: talking, listening, supporting, comforting. And helping people do what needs to be done every day, so they can live their lives. Defining Hope is a moving new film by Carolyn Jones. Her work is inspired by the nurses and patients she’s interviewed, as well as her own experiences. The film is born out of four years of research and the immeasurable wisdom of the nurses and healthcare professionals that we interviewed for both The American Nurse Project and the Dying in America website. After conducting more than 150 interviews, we learned how critical it is to consider what’s most important in life, to think about our own personal definitions of ‘quality of life,’ and to make time to discuss our values and wishes with our loved ones. It is our greatest hope that this film will help lead and catalyze a national dialogue that translate our interviewees’ recommendations into public action. Seeing what this film has already accomplished, I believe that it can, and will, fulfill that hope. Across the US, Defining Hope has mobilized nurses to collaborative grassroots action, to bring the film to their communities, building bridges and promoting dialog. The conclusion of this Call for Action is that seriously ill and injured patients, families, and communities should receive quality palliative care in all care settings. This is achieved by the delivery of primary palliative nursing by every nurse, regardless of setting. Defining Hope is creating a grassroots Palliative Nursing Movement, that can help make this Call for Action a reality. The filmmakers have used a risky, but astute strategy to achieve this hope, showing Defining Hope for one day in theaters, today, November 1. In addition, the film is only being shown in communities where nurses have asked for the film and are committed to supporting it. This grassroots approach has had a remarkable outcome. Today, there will be over 100 screenings of Defining Hope across the US, in all 50 states. •	In Milwaukee, Defining Hope is being shown at the 900-seat Landmark Oriental Theatre with a panel discussion after the film, which I’m privileged be part of. •	In Madison, Defining Hope is being shown in a 135-seat theater at the Marcus Point Cinema. Nurses have been buying up tickets, and it’s almost sold out. •	In LaCrosse, two theaters at the Marcus LaCrosse Cinema will be showing the film, one private with a panel discussion, the other a public showing with tickets still available. Those in the public showing will be able to attend the panel discussion in the other theater. In places where the film distributor could not arrange a theater showing, the producers have made it available for a community showing. •	In Oshkosh, the film is being shown tonight at the University of Wisconsin-Oshkosh Reeve Union Theater. •	Janesville will have a free community showing of Defining Hope at the local Armory Hall. •	Wisconsin will also have a Northwoods area screening, in Minocqua at the public library. I’m particularly excited about this because so much of Wisconsin is rural. We need to ensure that nurses in rural and underserved areas also have opportunities to connect with resources and take the lead in bringing palliative nursing to patients and families. Each showing of Defining Hope has it’s own organizers and story. I’m hoping that in the coming weeks coordinators for showings across the US can share some of their stories here. Over the last couple of months, the coordinators of these six Wisconsin showings have held joint planning meetings to share information, exchange experiences, and support each other. In this way, Defining Hope has been a catalyst for a new nursing network in Wisconsin that can continue to work together future collaborative palliative care outreach efforts across the state. Our grassroots effort in Wisconsin, fueled in part by social media, has had an unanticipated impact: Defining Hope will also be shown today in Brazil. My posts on Facebook led to interest from Lianna Correa Trotte, a nursing professor in Rio de Janeiro, who asked when it would be available in her area. Again, Carolyn Jones’ team came through in making Defining Hope available to a nurse who wants it. Liana will be showing Defining Hope today at 2 pm at the Universidade Federal do Rio de Janeiro where she teaches. 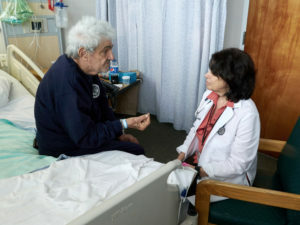 While Defining Hope is currently only in English with limited English subtitles, Liana believes that her Portuguese-speaking nursing and healthcare audience will understand the film, as it portrays the universal language of nursing care. These grassroots nursing efforts to bring Defining Hope to nurses everywhere is mobilizing nurses, and has the potential to be the tipping point of a national palliative nursing movement, to translate information into action. Interested in sharing your story about Defining Hope? Join in the conversation! I agree to receive emails from this group, and understand that I may opt-out at any time using the Update Profile link at the bottom of every email.